Size—at 470 km2, the Marsh is often referred to as the largest tidal marsh on the west coast of North America. While this claim is debatable, Suisun Marsh is certainly the largest tidal marsh in California. Position—located in the middle of the San Francisco Estuary, the Marsh has strong interactions through the movement of water and organisms between the Delta upstream and San Francisco Bay downstream. The Sacramento River delivers fresh water to the Marsh and strong tides mix it with salt water from the ocean, so the marsh’s salinity varies with place and season. The Marsh is also an important stop on the Pacific Flyway, providing habitat for migratory waterfowl and shorebirds. History—Suisun Marsh boasts a long history of being protected for its wildlife, especially waterfowl. Early duck club owners successfully protected the Marsh from various nefarious schemes to use it for waste disposal and development. The Marsh exists today as a center of fish and wildlife diversity because of its continued management as a marsh, albeit with a focus on waterfowl hunting. Most of the land in the Marsh is either part of privately owned duck clubs or wildlife areas devoted to hunting and wildlife management. Biodiversity—the Marsh supports a large array of plants and animals, especially native species: 221 bird species, 45 mammal species, 16 species of reptiles and amphibians, and more than 50 species of fish. Some of these species, such as the Suisun song sparrow, are endemic to the Marsh. Location—on the urban fringe, the Marsh provides a major oasis of wildlife habitat in a rapidly developing area. The success of Rush Ranch Open Space, on the north side of the marsh, demonstrates that it is increasingly important as open space. It is not surprising, with all these attributes, that Suisiun Marsh is increasingly looked upon as a major conservation and mitigation site, especially for actions in the Delta. Just how actions in Suisun Marsh can mitigate for decline in natural habitat in the Delta is not entirely clear, especially because the Marsh is already intensely managed as wild lands. 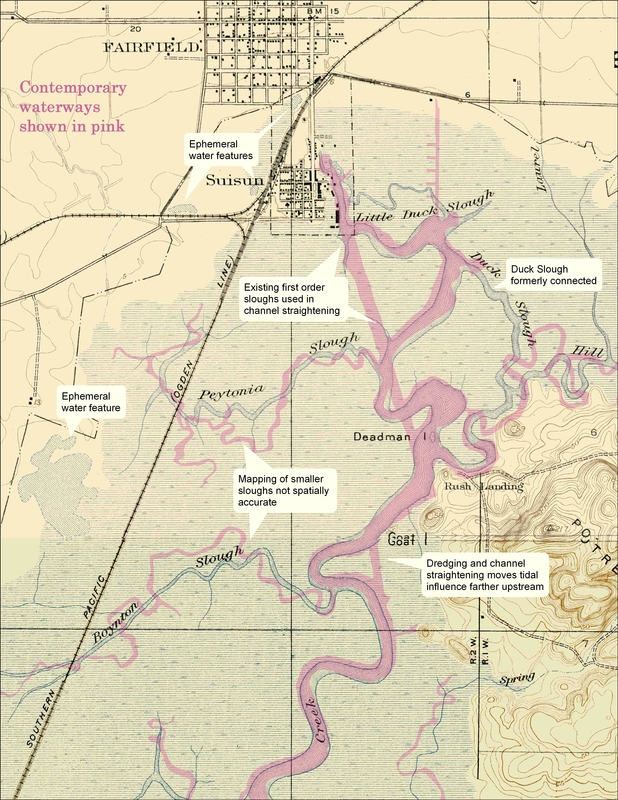 This USGS topographic map, surveyed in 1906, provides a wealth of information about conditions before channel modification, levee building and urbanization in the northern portion of Suisun Marsh. This map, as well as surrounding USGS quadranges from the same era, are available at the UC Davis map library. It is also important to recognize that the Marsh is constantly changing. In the past 150 years, it has been transformed from a natural tidal marsh used as rich source of food and fiber by local Miwok people, to farmland and pasture, to a highly managed entity with over 300 km of dikes separating marshlands from the intervening sloughs. Management of duck clubs today focuses on producing resident mallards and, secondarily, attracting migratory waterfowl in winter. There are also a number of protected areas maintained as habitat for rare species. Change will continue in the Marsh at an accelerated pace. Most conspicuously, sea level is rising. Best estimates are that it will rise by 1 to 1.5 meters by 2100, with high tides, storm surges and floods pushing the water higher. Given that much of the marsh is at or below sea level, eventually large portions are likely to become permanently flooded, subtidal or intertidal habitat, as dikes give way or are breached. There are planning efforts for the Marsh underway but the Suisun Marsh Habitat Preservation and Restoration Plan focuses on maintaining the Marsh as much as possible in its present state. This may be possible within a 30-year time frame, especially for areas of higher elevation, but as time goes on, the status quo will become less and less sustainable, in particular because one emphasis of the Plan is to dredge tidal channels, which may exacerbate the effects of sea level rise. The perception that large-scale change to Suisun Marsh is inevitable was the stimulus for a symposium on May 23, 2011: Suisun Marsh in the 21st Century: a landscape of change and opportunity. This symposium, in turn, was a kick-off for producing a book on the history and future of the Marsh. The symposium focused on change, including the presentation of a series of historic maps that show surprising transformation of Marsh waterways over the decades. Various talks addressed ongoing biotic changes, often reflecting invasions of alien species, especially plants, fish and aquatic invertebrates. But physical changes to the Marsh, from sea level rise, land subsidence and other factors, are also driving changes to the biota and will continue to do so. So what is the long-term future of Suisun Marsh 100 or more years from now? There is no doubt that it will continue to function as open space and as important habitat for wildlife, fish and plants, although aquatic and salt-tolerant species will become increasingly important. The degree to which this happens depends on how fast sea level rises; under some scenarios, tidal water will eventually be flooding the streets of Suisun City. To some degree, we can determine the direction and extent of change to marsh habitat. One future scenario is to continue to manage the Marsh as a series of independent, ‘postage stamp’ areas, as is largely done today with the 158 private duck hunting clubs and a handful of public wildlife areas. The best marsh habitat (for waterfowl especially) will belong to whoever builds the highest and strongest dikes or starts with higher elevation land along the marsh fringes. Other scenarios generally treat the Marsh as one area with unified management. For example, one scenario is to build the biggest dike possible along some strategic line through the marsh. This would protect the marshlands behind it and, eventually, urban areas as well, from salt water incursion. From an ecological point of view, a more desirable scenario is to work with sea level rise and other factors and try to create a ‘new,’ evolving Marsh with as many desirable features as possible (e.g. natural tidal channels). This latter scenario, of course, would require agencies, local landowners and other California citizens to agree upon the desirable features towards which to work. Developing such scenarios will be a focus of the new book on the ever-changing Suisun Marsh, which we hope to have finished in a year. We welcome your ideas. Note: The symposium on May 23 was a cooperative venture of the Center for Aquatic Biology and Aquaculture and the Center for Watershed Sciences with logistical funding from the Delta Science Program. It was organized by Peter Moyle, Amber Manfree and Lisa Thompson. 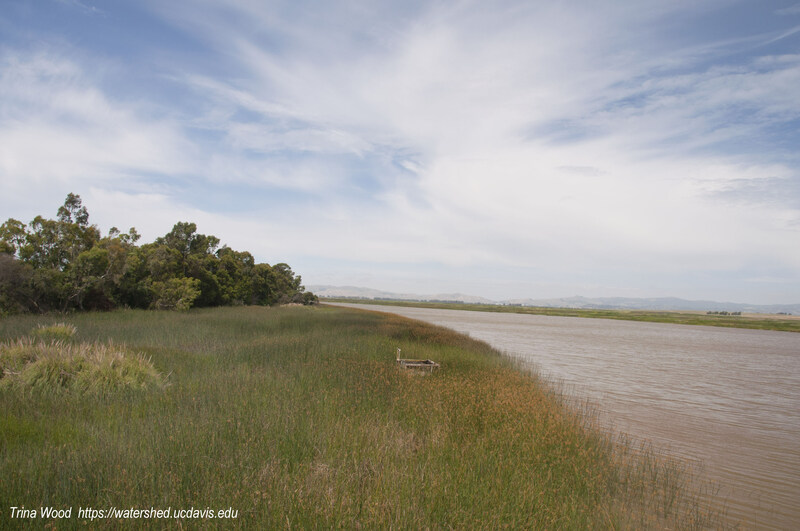 The talks can be viewed at http://caba.ucdavis.edu/seminars/2011/suisun-marsh-in-the-21st-century-a-landscape-of-change-opportunity/?searchterm=suisun%20marsh. U.S. Geological Survey. Suisun Quadrangle, California [map]. 1918. 1:31,680. 7.5 Minute Series. Reston, VA: United States Department of the Interior, USGS, 1918. Rowell, J. List of printed maps of California, p. 22. Cf. Phillips. Maps of America, p. 780 (1851 ed.) 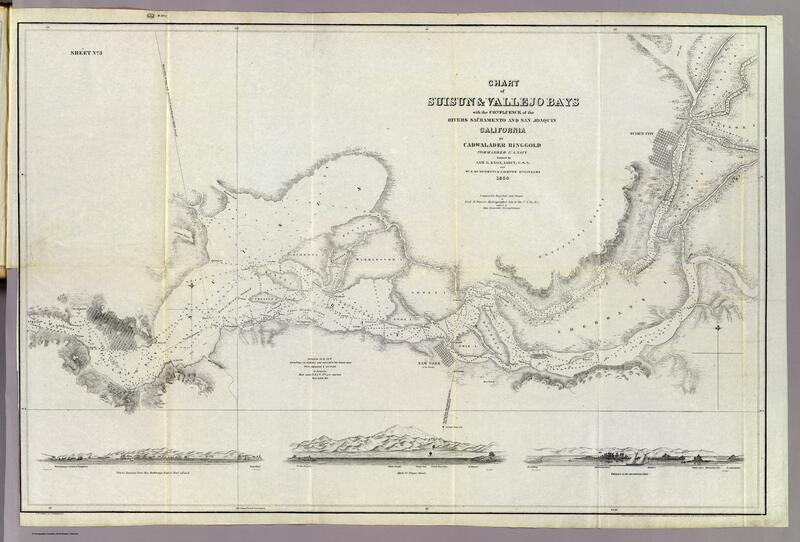 Courtesy of the David Rumsey collection: Chart of Suisun & Vallejo bays with the confluence of the rivers Sacramento and San Joaquin, California by Cadwalader Ringgold, Commander, U.S. Navy. Assisted by Sam R. Knox, Lieut. U.S.N. and Wm. P. Humphreys & J.H. Rowe, engineers, 1850. Constructed, projected and drawn by Fred. D. Stuart, hydrographer, late of the U.S. Ex. Ex., assisted by John Tyssowski, draughtsman. C.B. Graham, Lithr., Washington, D.C. Entered … 1851, by Cadwalader Ringgold … District of Columbia. This entry was posted in California Water, Restoration and tagged California, ecosystem, estuary, Moyle, reconciliation ecology, Suisun Marsh, tidal marsh habitat, UC Davis Center for Watershed Sciences. Bookmark the permalink.